Stuart Moore: 7.5 - Absolutely stunning late save from Mullin ensured Town weren’t pegged back again. Control of his area was noticeable again as his stock rises with every match. James Justin: 6.5 - Quieter game than he had enjoyed the previous week at Accrington, but looked defensively sound. Ankle injury cut short his afternoon and really hope it isn’t serious as youngster deserves to be involved in the play-offs. Dan Potts: 7.5 - Played as a regular left back this time but it was his work in the Shrimps area that caught the eye. Won countless headers from corners, playing a huge role in Town’s opener as when his effort was blocked, Vassell did the rest. Scott Cuthbert: 6 - Had a nervy 10 minute spell in which he stopped doing the things that he has done so well this term. Left a long ball which allowed Morecambe to break and then hauled back Mullin for the penalty too. Glen Rea: 6 - Like Cuthbert, endured an indecisive period in the second half allowing the Shrimps opportunities they shouldn’t have been afforded. Thankfully it didn’t cost Town but will need to be back on it against Blackpool. Olly Lee: 7 - Got stuck in once more and also there to play some delightful crossfield passes. Started the move which saw Marriott put the result beyond doubt too. Pelly-Ruddock Mpanzu: 7 - Got forward well and set up Gambin for an excellent opportunity early on. All-action style made sure Town won the midfield battle. Jake Gray: 7.5 - Really came into his own during the second half as his distribution enabled Town to attack. Excellent through ball sent Marriott away to do the rest, while never afraid to try his luck from range. Luke Gambin: 7 - In from the start after an injury to Sheehan and he delivered some dangerous crosses from the right hand side. Corners caused problems all afternoon as Luton looked a real danger from set-plays, while should have scored too. Ollie Palmer: 7 - Striker looked dangerous at times in the air and was denied his fourth goal in Luton colours by an excellent stop from Roche. Isaac Vassell: 8 - In the right place to tap home his 13th of the season as the striker looks to be finding his goal touch at just the right time for the play-offs. Wonderful celebration too! Stephen O’Donnell (SUB): 7.5 - Replaced the injured Justin and was up to speed instantly, playing a part in the build-up to Marriott’s goal in an impressive half hour. 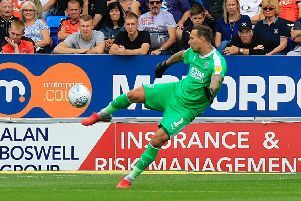 Jack Marriott (SUB): 8 - On for 17 minutes and did magnificently in that time, scoring twice with clinical finishes to ensure Hatters finally made it three wins from three. Lawson D’Ath (SUB): 6.5 - Good to see him back late on as his availability will give Jones a headache next Sunday.